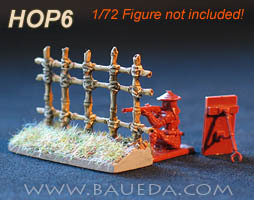 15mm Japanese Field Fortifications AVAILABLE NOW! 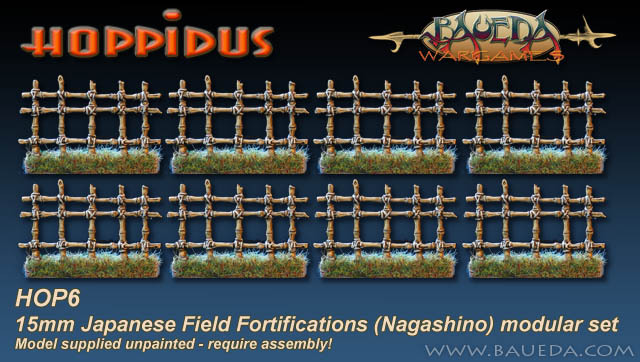 This set include eight modules of 15mm Japanese Field Fortifications that can be used to create continuous lines behind which arquebusiers can shoot while remaining outside the reach of cavalry, as in Nagashino (1575). These models are very detailed and accurate reproductions showing the typical arrangement as depicted in several contemporary illustrations. The palisade itself is cast in our usual very high quality lead free alloy while the bases are realized in tough polyurethane resin, so these are scenic pieces that are not only beautifully sculpted, they will also last you a lifetime! 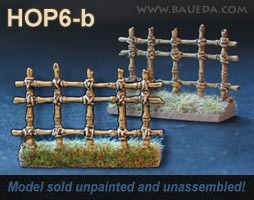 Based on our "HOPPIDUS" modular system for ancient fortifications this set includes 8 x 15for-AX standard 40mm wide bases and 8 x 15FOR-9 medieval-reinassance Japanese palisade fences, 16 parts in total. 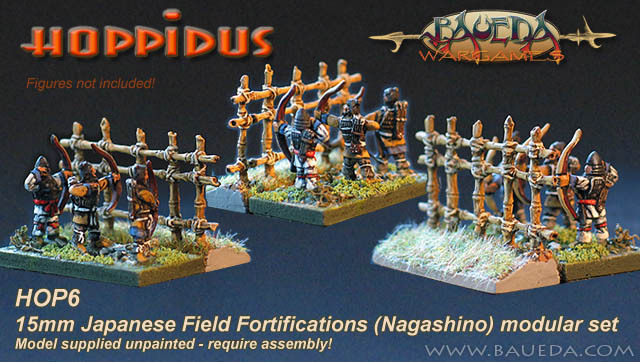 The 15mm figures are shown for size comparison only and are from our own range of Emishi (500AD - 1100AD). While being designed specifically for 15mm these works quite well also with 1/72 plastic figures as you can see here ; they should be a bit larger to be in exact scale, but I think you would agree they still look the part! HOPPIDUS is a truly modular system, and all elements of this set are compatible with each other. 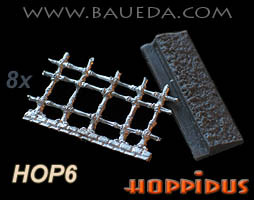 This means you can also add more elements from the complete HOPPIDUS range to expand and customize this basic set. For your convenience we offer also an expansion pack designed specifically for this set, but remember you can pick and choose any combination of modules you like, at any time, just e-mail us your requirements! This is a booster pack to increase the size of your fortified line by two elements. The pack include all the modules required to make two complete Field Fortification elements: 2 x 15FOR-AX and 2 x 15FOR-9.